Choose a link from the list on the left. 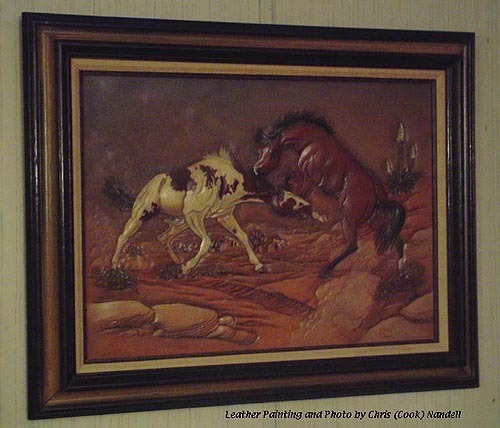 I was very involved in the art of Leathercraft from 1980 - 1984; working at the Local Tandy Leather Co. Store, making the store samples and teaching Leathercraft to others. I also did a lot of custom Leathercarving and sold dozens and dozens of Wallets, Belts and Purses and even a Painting or two. And I worked in a Tack Shop and did repair work on all kinds of horse tack. I had a couple of wonderful teachers when I started out, The late Felix Walton and Bill Gomer, who has gone on to become one of the most recognized Leathercarvers and Saddlemakers in the country. I was a member of the local Leathercraft Guild (Mid-American Leathercarvers), and showed my work in competition at International Federation of Leathercarvers Shows in 1981 and again in 1983, garnering several top honors. Due to changes in my life, I stopped doing leather work completely in 1985 and packed up all of my tools and supplies. In October of 2007 I decided to unpack everything and set my Leathercraft Shop up again, and create this web page in anticipation of the new pieces I will be creating. I don't have many photos of the pieces I created back in the 80's, but what I do have I will share with you here. THANK YOU for your interest and enjoy your visit!